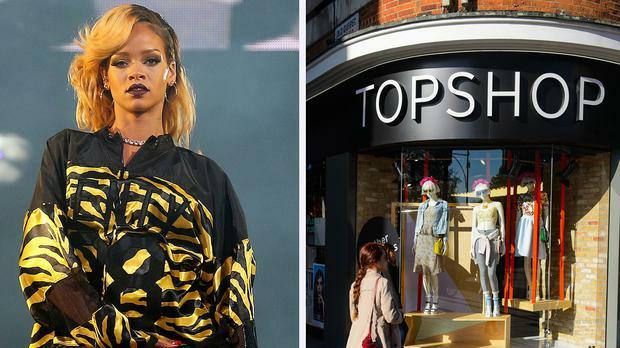 Rihanna has won a legal battle with high street store Topshop over a T-shirt with her image. In an important ruling on celebrity "image rights", the Court of Appeal upheld a ban on the store selling a Rihanna "tank" sleeveless T-shirt without the pop star's permission. Three appeal judges agreed with an earlier High Court ruling that marketing the fashion item without the 26-year-old singer's approval amounts to ''passing off'', a term used to enforce unregistered trademark rights. Topshop lawyers had urged the appeal judges - Lord Justice Richards, Lord Justice Kitchin and Lord Justice Underhill - to rule that High Court judge Mr Justice Birss had misunderstood the law on celebrity merchandising. The three judges unanimously dismissed the Topshop appeal. In the lead judgment Lord Justice Kitchin ruled Mr Justice Birss "was entitled to find that the sale by Topshop of the T-shirt amounted to passing off". The judges also agreed that a substantial number of the 26-year-old pop diva's fans were likely to be led into the false belief that she had authorised the T-shirt to carry her image. Rihanna's lawyers said the image was from an unauthorised photograph taken while the star was filming a video in Northern Ireland for one of her singles in 2011 and Topshop should remain banned from exploiting it. Geoffrey Hobbs QC, appearing for Topshop, which is part of the Arcadia Group, had argued at the hearing that the court was dealing with a "decorated T-shirt" in a tradition of the merchandising of star images over the decades, including those of Elvis Presley, Jimi Hendrix and Prince. Mr Hobbs submitted Rihanna was in reality using the law wrongly to claim that "only a celebrity may ever market his or her own character". Rihanna has various lucrative endorsement deals with retailers including Topshop's high-street rival River Island. Mr Hobbs contended the public had no expectation that clothes bearing an image were authorised by people shown in that image. He challenged Mr Justice Birss's ruling that, although celebrities had no general right to control the reproduction of their image, Topshop's use of RiRi's image did amount to passing off. The judge had observed the use was damaging to the star's "goodwill" and represented loss of control over her reputation in the "fashion sphere". During the recent hearing that led to today's ruling, Court 68 at the Royal Courts of Justice in London was given a shopping mall makeover with racks of T-shirts on display. Rihanna fought her legal battle under her full name Robyn Rihanna Fenty. She was referred to by the court as "one of the most popular recording artists in the world". The T-shirt photo of her was "a striking image". She was concerned about the sale of fashion garments bearing her image. In the seven years before she started the legal action she had sold around 30 million albums and 120 million singles. She had performed songs she had recorded in five major tours and won over 200 awards, including five prestigious Grammy awards..
Lord Justice Kitchin said she also ran "very large merchandising and endorsement businesses" which, over the years, included endorsement agreements with Nike, Gillette, Clinique and LG Mobile. The merchandising business was originally managed by a company known as Bravado. In 2010 and 2011 goods authorised by Rihanna and sourced through Bravado were available in Topman stores, which was in the same group as Topshop. "Since 2012 this business has been managed by another company called Live Nation which expects to earn significant sums from the sale of conventional merchandise associated with her," the judge said. Rihanna's agreement with Bravado did not extend to fashion garments, but she had made "considerable efforts to promote an association in the public mind between herself and the world of fashion". In 2012 Topshop began to sell in its stores, and through its website, a fashion T-shirt displaying a "clearly recognisable" image of Rihanna, said Lord Justice Kitchin. The judge went on: "The image was derived from a photograph of Rihanna which was taken when she was on a video shoot for a single from her Talk That Talk album. "Rihanna is looking directly at the camera with her hair tied above her head with a headscarf. "It is, as the (High Court) judge thought, a striking image and similar images had been used by Rihanna in connection with the Talk That Talk album. "This particular photograph was, however, taken by an independent third party photographer. He, as owner of the copyright in the photograph, licensed the use of the image to Topshop." Rihanna and two of her corporate licensing vehicles - Roraj Trade LLC and Combermere Entertainment Properties LLC - launched their legal action alleging the use of her image in relation to fashion clothing was not licensed, but a substantial number of people buying the T-shirt would think that she had endorsed it when, in fact, it was not connected with her at all. Rihanna contended that Topshop's activities therefore amounted to passing off. The judge said Topshop responded that Rihanna had "not asserted that this particular image or any features of it" had become distinctive of her or her clothing. Topshop lawyers accused the singer of using the legal proceedings to "claim an image right - that is to say a right to control the licensing of her name and likeness". They submitted that "no such right is recognised in English law". Rejecting the Topshop appeal, Lord Justice Kitchin said: "Rihanna has always accepted that she has no right in English law to prevent any use of her image. "Further and specifically, she acknowledges that the sale of garments bearing recognisable images of her does not, in and of itself, amount to passing off." However, it did not follow that "the image itself must be excluded from the matrix of facts which are said to give rise to an overall representation that she has endorsed the goods to which it has been applied. "I am entirely satisfied that the proposition that a famous personality has no right to control the use of her image in general does not lead inexorably to the conclusion that the use of a particular image cannot give rise to the mistaken belief by consumers that the goods to which it is applied have been authorised. "Here the judge came to the conclusion that the use of this particular image on fashion T-shirts sold by Topshop amounted to a misrepresentation by Topshop that the garments had been approved or authorised by Rihanna. "There is no inconsistency between this finding and the proposition that Rihanna has no absolute right to prevent traders selling garments carrying her image." The High Court injunction granted to her "simply recognises that the vice in the impugned activities lay not in the use of Rihanna's image but in using it in such a way as to cause a misrepresentation." The judge said Topshop was in effect "contending not for the absence of an image right, but rather for a positive right to market goods bearing an image even if the use of that image in particular circumstances to particular customers gives rise to a misrepresentation. "To accede to that submission would be to sanction a trade which results in the deception of the public." Both other judges agreed with his ruling, although Lord Justice Underhill said he regarded the case as "close to the borderline".